ZDR is built from the ground up to reduce the complexity and cost of deploying demand and fast frequency response (FFR) programs. Everything you need to enrol and dispatch assets in one box. With open API’s and protocols, it integrates easily with your existing infrastructure, without reliance on any 3rd party servers or services. Stream frequency, power and other data to any server or IoT platform up to once per second, with up to 30 individual ‘sensors’ available on each ZDR. 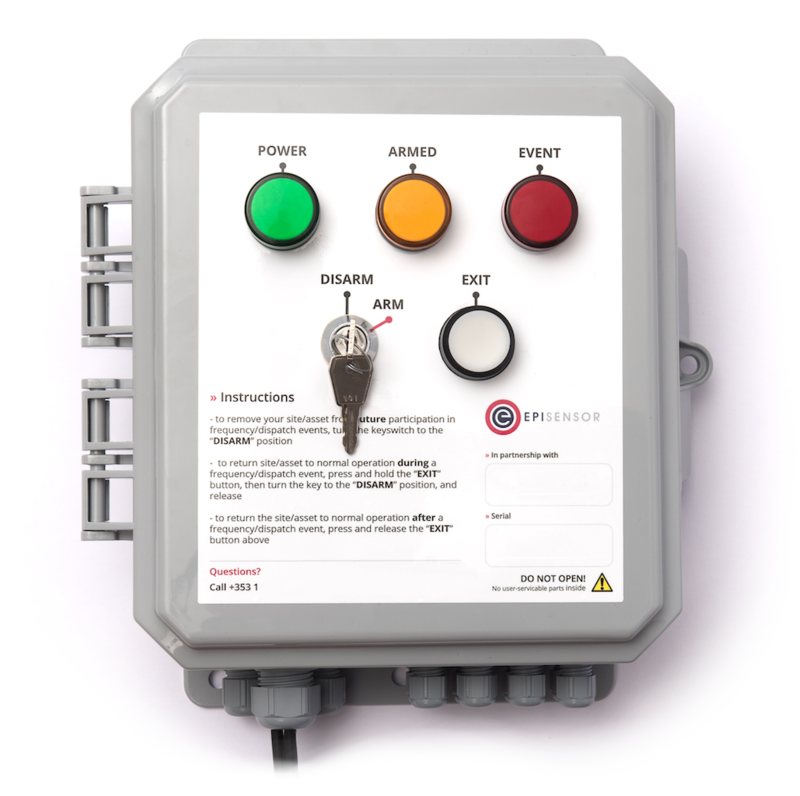 Respond to under-frequency events within 80 milliseconds of the event happening, with fully configurable set points and delays. ZDR has been designed from the ground up for distributed virtual power plants and can achieve up to a 10x reduction in cost and complexity vs. traditional hardware. On-board dual 4-20mA inputs, dual high-frequency pulse inputs, RS-485 (Modbus), and 4x Form C relay outputs make it easy to interface to 3rd party metering and control systems. EpiSensor’s REST API lets you manage all aspects of ZDR remotely. Dispatch an asset, change set-points dynamically, reconfigure delays and monitor sensor data – all without any reliance on external servers or services. On-board ZigBee mesh networking makes it easy to deploy and configure multiple ZDR’s per site, reducing infrastructure cost and disruption and simplifying the electrical installation. Give your users the option to arm, disarm and override dispatch events safely and intuitively with the optional front panel user interface. When remote control of large industrial assets is involved, security is paramount. EpiSensor’s IoT platform is trusted in some of the world’s most secure and sensitive environments, like banks, data centres, and hospitals. 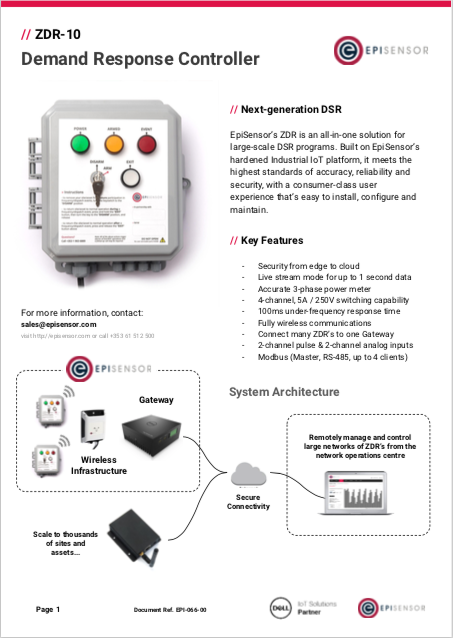 EpiSensor has a complete range of compatible wireless sensors that can co-exist with ZDR on customer sites to easily monitor electricity, digital / analog signals and 3rd party hardware. Interested in how ZDR can help reduce costs and complexity by up to 10x for your DR portfolio? Check out the datasheet at the link below, or fill in the form to schedule a demo!